With the accessibility of Manhattan Beach, more and more people settled in town which made it evident that improvements had to be made. Prior to electricity, the Strand was lit by scattered gaslights with gas supplied by a small carbide plant located at Tenth Street and Highland Avenue. At dust fall each light was separately lit and all were extinguished around 10 p.m. In 1906, an electric lighting system was the first achievement of the Manhattan Beach Improvement Association, the forerunner of the towns Chamber of Commerce. The Association was organized to look after the needs of the community and to boost its development. Letters were sent to the property owners suggesting the installation of electric streetlights, to burn from dusk to midnight every night in what is now the downtown area. The first electric light tender was Bob Kuhn Jr., who was paid $3.00 per month for duties that included setting the master switch and replacing burned out bulbs. The Strand lights, like those on Center Street, were set atop wooden poles spaced about a block apart, each one holding a single Edison carbon filament bulb. The Pacific Electric Company was awarded the contract over a lighting company, which had bid $2,000 to put in the system and operate it for one year. However, the Pacific Electric Company installed, completed and turned the system over to the Association districts for the cost of the construction. Assessment districts were formed according to how far they were from the center of town. Though this was the beginning of public utilities, most of the town remained devoid of such services. Prior to a water system, wells and tanks served the needs of the downtown area. One well and tank were perched on the crest of the sand dunes around the 300 block of 16th Street east of Highland, the other located on the hill about 13th Street and Highview Avenue. After the paving of Highland, the 16th street well was abandoned and water was supplied by the Hermosa Beach Land and Water Company, which was owned in part by Sherman and Clark, developers of the "Red Car" system. When water pressure went down, users inspected the pipes that lay on the sand and repaired the leaks. Later, on the Miller Tract at 31st and Pacific Avenue, a water tank was installed making it possible for residents to get water in buckets for home use. On February 7, 1914, the bids were opened for the construction of a municipal water system, as the voters had passed a $111,000 bond November 22, 1913. In all 23 miles of pipe was laid, yet there were those who felt it was far from complete as there was considerable territory within the city limits, which did not have the benefit of the system. That same year, the Hermosa Land Water Company petitioned the state Railroad Commission for permission to withdraw from the territory of Manhattan and El Porto. It was suggested that the town and the officials of the company get together and find a solution to their differences. Indeed a solution was found in the way of a final contract between the city and the water company. In 1914, at the intersection of Pacific Avenue and Lefflor Road (now 35th street), water was supplied to the Standard Park area, now known as the Tree Section. The land was sub-divided, and each street was planted with different species of trees (i.e. Oak, Elm, Walnut, Palm, etc.). I'm fascinated by this picture. My guess is that it's looking west on what is now Manhattan Beach Blvd; the intersection just before the top of the hill is Peck. Am I correct? great picture and commentary. in 1946, when my parentsmoved to mb, east of sepulveda, 9th and johnson, there were no roads, just dirt, fields, and no sewers, bareley water, they camped out until the house was built. when i was born, a few years later, still the same. 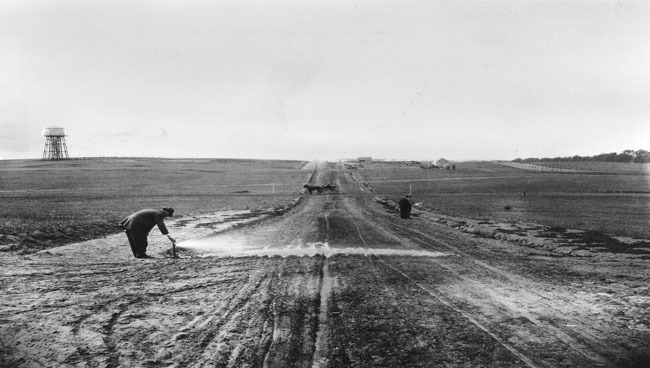 it wasn't until early mid 50s that it became necessary to rezone andput i sewers and finally paved streets,. the animals went and so did the farms. i love the history of my home town.